AYSO 1344 Brisbane is excited to announce that Challenger Sports British Soccer will be running a week-long soccer camp for all players this summer on the week of August 4-8 for boys and girls aged 3- 14 years old. Professional British coaches will work with our players to help develop foot skills, core skills and techniques in the game to improve ball control, 1v1’s, passing and shooting and defending. Over 125,000 children experienced this camp last year in the USA. All kids get a free ball and t-shirt, player evaluation and soccer poster and by signing up on-line before June 20th every player will get a FREE British Soccer Jersey! Want to host a British coach for the week of camp? Call Lee Dunne 916 596 1664. Congratulations to the U12 Brisbane AYSO girls!!!! 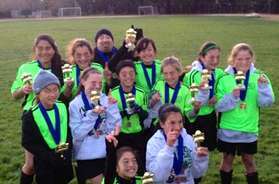 The U12 team is headed to the section 2 tournament on December 14-15, 2013 in Foster City. GREAT JOB TEAM!